Alpro Soya Growing Up drink 1-3+ is a 100% plant-based soya drink that is nutritionally tailored for your toddler from 1 year onwards. It is low in sugars and provides little ones with key nutrients needed for normal growth and development*: calcium, vitamin D, protein and iodine for normal growth and iron for the brain**. On top of that, it is naturally lactose free, making it an easy alternative to dairy for lacto-intolerant children. Can be served hot or cold and used in all cooking applications. *Calcium, vitamin D and protein is needed for normal growth and development of bone in children. Iodine contributes to the normal growth of children. **Iron contributes to normal cognitive development of children. Contains soya. Free from cow's milk protein. Naturally lactose free & dairy free. Gluten free. Why choose Alpro soya Growing Up Drink for your toddler from 1 year onwards ? Alpro soya Growing Up Drink is nutritionally tailored as a main drink for your toddler from 1 year onwards. It provides toddlers with key nutrients that are needed for normal growth and development. As Alpro soya Growing Up Drink is 100% plant-based, it's ideal for children following a dairy free diet, whether they are lactose intolerant, have an allergy to cow's milk protein or following a vegan or vegetarian diet. It provides toddlers with nutritious soya protein, this high-quality soya protein contains all 8 amino acids in a sufficient amount. These essential amino acids cannot be produced by the body and must be provided through protein in a healthy diet. Calcium, Vitamin D and Protein are needed for normal growth and bone development in children. Vitamin D is there for the absorption of calcium. Iron is a mineral and helps the normal cognitive development of children. Iron, Vitamin B12, C and D helps with the normal function of the immune system. Alpro soya Growing Up Drink is low in sugars with only 2.5g of sugars/100 ml. The type of sugars has been changed from fructose-glucose syrup to a combination of sugar and fructose in order to further improve the nutritional profile and general quality of the product. The type of sugar used is raw cane sugar and this ensures a better quality end product and fits better with Alpro's vision as a sustainable company. How can I use Alpro soya Growing Up drink? Can Alpro Soya Growing Up drink 1-3+ be heated? Alpro Soya Growing Up drink 1-3+ can be served hot or cold. It can be used in all your recipes as a substitute for cow's milk. Is Alpro Soya Growing Up drink 1-3+ suitable for infants/children/toddlers? From the age of 1 year, Alpro Soya Growing Up drink 1-3+ can be used as a main drink in a child’s diet. The nutritional composition of Alpro Soya Growing Up drink 1-3+ makes this nutritionally tailored drink suitable for infants/children/toddlers. Until the age of one, breast milk, specific infant formulas or follow-on milk should be given as the main milk drink alongside an increasingly varied diet. Why can Alpro Soya Growing Up drink 1-3+ only be used from 1 year onwards? It’s recommended that up until the age of one babies should only be fed either breast milk or infant formula as their main milk drink. After this age their needs and requirements change. Alpro soya Growing Up drink has been specially designed to help meet these nutritional needs and, just like full fat cow’s milk, can be used as a main milk drink from one year onwards. How does Alpro Soya Growing Up drink 1-3+ differ from semi-skimmed cow’s milk? Alpro Soya Growing Up drink 1-3+ has been tailored to meet the nutritional needs of children from one year onwards. The biggest difference of Alpro Soya Growing Up drink 1-3+ in comparison to semi-skimmed cow’s milk is the presence of vitamins C, D, Iron and Iodine which bring a lot of benefits for children/toddlers. 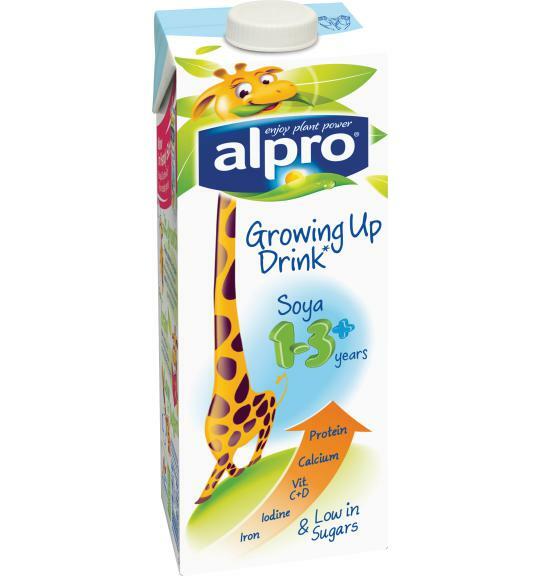 Alpro Soya Growing Up drink 1-3+ is also lower in sugars than semi-skimmed cow’s milk (2,5g/100ml versus 4,5g/100ml). Just like semi-skimmed cow’s milk, this drink contains protein, vitamins B2 and B12, and calcium. The total fat content of the Alpro Soya Growing Up drink 1-3+ is slightly higher than semi-skimmed cow’s milk (2,2g/100ml versus 1,6g/100ml). However the presence of vegetable oils, from the soya oil and added sunflower oil, provides this drink with a healthy balance of fats - low in saturates and containing both mono and polyunsaturates. Just like all other Alpro products, the Alpro Soya Growing Up drink 1-3+ is 100% plant-based and therefore naturally free from lactose and cow’s milk protein. What’s the difference between Alpro Soya Growing Up drink 1-3+, a soya-based growing up drink and a milk-based growing up drink? Just like all other Alpro products the Alpro Soya Growing Up drink 1-3+ is 100% plant-based and therefore naturally free from cow’s milk protein and lactose. In addition the Alpro Soya Growing Up drink 1-3+ is low in total fat content in comparison to a milk-based drink 2,2g/100ml versus 2,6g/100ml. The Alpro Soya Growing Up drink 1-3+ is low in sugars and even lower in sugars than milk-based growth drinks (2,5g/100ml compared to 4,8g /100ml in milk-based drinks). How does the Alpro Soya Growing Up drink 1-3+ help the ‘normal growth’ of my child? Alpro soya Growing Up drink 1-3+ is a source of calcium, vitamin D, protein and iodine: Calcium, vitamin D and protein are needed for normal growth and development of bone in children. Iodine contributes to the normal growth of children. How much Alpro Soya Growing Up drink 1-3+ should my child drink a day? From 1 year, your toddler will need about 2x 150ml of milk per day as part of a balanced diet. Alpro Soya Growing Up drink 1-3+ is specially formulated to help meet the nutritional needs of your little one, providing them with hard-to-get nutrients such as vitamin D. It can be used as a drink or mixed with other foods. Is Alpro Soya Growing Up drink 1-3+ suitable for children with a cow’s milk allergy? All Alpro products, including the Alpro Soya Growing Up drink 1-3+ are 100% plant-based and do not contain cow’s milk protein. Is Alpro Soya Growing Up drink 1-3+ suitable for children with lactose-intolerance? All Alpro products, including the Alpro Soya Growing Up drink 1-3+ are 100% plant-based and therefore naturally lactose-free . Why is Alpro Soya Growing Up drink 1-3+ ‘low in sugars’? Why does it still contains sugar(s) ? Will my child get enough calories and nutrients if they drink the Alpro Soya Growing Up drink 1-3+ every day? Alpro Soya Growing Up drink 1-3+ is nutritionally tailored for your toddlers/ child from one year onwards. It provides toddlers/ children with key nutrients needed for normal growth and development: • Calcium, Vitamin D, Protein and Iodine for normal growth* • Iron contributes to normal cognitive development of children. • Vitamin D for the absorption of Calcium. • The right amount of nutritious soya protein adjusted to the needs of your toddler. Our high-quality soya protein contains all 8 essential amino acids – the building blocks of protein – in sufficient quantities to meet your toddler’s requirements. These essential amino acids cannot be made by the body and must be obtained by eating protein in a healthy diet. • A low amount of saturated fats • Iron, Vitamin B12, C and D for the normal function of the immune system. *Calcium, vitamin D and protein are needed for normal growth and development of bone in children. Iodine contributes to the normal growth of children. When used as part of a varied, balanced diet, in the recommended amounts (see relevant question), this growth drink provides adequate amounts of calories and nutrients for children 1-3 years of age.